A few days later than I had planned, but for a review of such a special beer perhaps the wait was necessary. This post will serve for me as a closing of the chapter for this year’s Surly Darkness mania that swept into my life on the eve of Darkness Day several weeks ago. This beer has created quite a ruckus this year, casting out ripples of excitement and joy as well as frustration and debate extending beyond the Twin Cities craft beer scene to several national craft beer blogs/news sites (Beer Advocate (from discussion forum) BeerNews, BeerNews Again, The Full Pint) and into some more mainstream local media outlets (Fox 9, Kare 11, Star Tribune, City Pages blog). Why all the news? Well, in a nutshell, in addition to the already highly anticipated release of a beer that is sought after by craft beer lovers from across the country, the prices being charged by some local liquor stores stirred up some serious controversy in the craft beer world (most discussed was $36.99/bottle at Surdyk’s while Surly sold it for $18/bottle on Darkness Day and many retailers charged roughly that price). I was able to purchase mine for $17.99, which is what many retailers were charging and what I had assumed they all would. After watching this unfold so closely (and from the recent mania that the Founders CBS release caused) I have come away feeling that clearly people are very (very) passionate about excellent beer (which is awesome) and an increasing number of people are being exposed to craft breweries through the hype that is generated around their limited releases (which is also awesome), but as a segment of the population that generally prides itself on having refined tastes or being conscious consumers some amount of perspective seems necessary. Beer has always been a catalyst for bringing people together and that is important to remember. Is it easy for me to not be bothered by the limited nature of the release because I was one of the lucky ones who got some? Sure, but I also believe that if you are in the know, you have some responsibility to act as a good steward to the rest of the community. I have done my best to let friends know where they may have luck finding a bottle or what restaurants were serving it on tap, and most importantly, I invited some friends over (most who had never tried Darkness before) and shared the celebration with them. I’m not trying to sound holier than thou, but I am suggesting that it is more important to celebrate and share something as special as Darkness in such a way that it gets better each year, rather than focusing on amassing an epic beer collection. After all, what good is a super special beer if you don’t celebrate it with people? Aroma: Dark chocolate syrup is the first to woft up from the glass, which fades in behind blackberries, cherries and caramel. After another swirl some vanilla comes out in the blend with just a light bit of coffee and anise (black licorice) at the end of the sniff. Flavor: The dark chocolate and cherry/berries flavors blend together beautifully tasting like chocolate covered fruit. After a bit of the sweetness gives way, savory caramel and vanilla come forward to add another layer of decadent complexity. There is a minimal amount of astringent bitterness on the finish with just a bit of that 10 or so percent ABV coming through as well. Mouthfeel: This is a rich, viscous beer! The dense carbonation gets swallowed up in the thickness of the beer and arrives on my palate like a thinner chocolate syrup. It coats the tongue and mouth pretty much entirely and taints any other flavors coming in shortly after. Overall: Though this is not my first encounter with Darkness, it is my first formal review of it, and it reminds me that there is more than just hype to this beer, it is just damned good. It is definitely on the sweeter side of the Russian Imperial Stouts that I have had, but that is fine with me. I prefer sweetness to heavy roast/coffee bitterness most of the time. Though it is sweet and has fruit presences, it is balanced out with enough hoppiness and roast to keep it from feeling overly rich or cloying. I enjoyed this beer in good company and also with some homemade brownies. The milk chocolate from the brownies was like double dipping the cherry/berry flavors and enhanced the vanilla and caramel aspects, it was a pairing that worked very well and is a good reason why Russian Imperial Stouts are often served as dessert beers. It has been a whirlwind few weeks that Darkness has occupied this year, and I hope that some of the contentious issues that were raised can be remedied for next year so that the focus can remain on appreciating a truly great work of craft beer art. In case you couldn’t make it out to the Four Firkins over the weekend, it was quite an evening. There were great speeches, bagpipes, people, and one other thing, oh right, beer. Surly-5 was on tap as was Brau Brothers-MooJoos, Lift Bridge-Farmgirl, Summit-Unchained #8: Black Ale, Fulton-Sweet Child of Vine, Bell’s-Sparkling Ale, and pouring from growlers or bottles was the whole Steeltoe lineup, several Schell’s offerings, and Dave’s Brew Farm-Matacabras (and other selection). Also poured during the evening was a 6 Liter bottle of St. Feullien-Trippel (which everyone that sampled, signed) and many bottles of Deus Brut des Flandres from Brouwerij Bosteels (a Belgian ale which is brewed and fermented, then shipped to France and undergoes a secondary fermentation with champagne yeasts and is aged for 9 months in French champagne caves. A one-of-a-kind beer). There was an amazing showing of support for the store with several brewers, brewmasters, some Cicerones, and tons of craft beer lovers on hand. I was happy to have been a part of the historic night. Coming this Thursday: Another installment of The Local Mash featuring Finnegans (technically not a brewery, but an innovative, non-profit beer brewing company, located in Minneapolis) with a PSA about their annual “Drink Like You Care” fundraising effort focused on fighting hunger in the Upper Midwest. 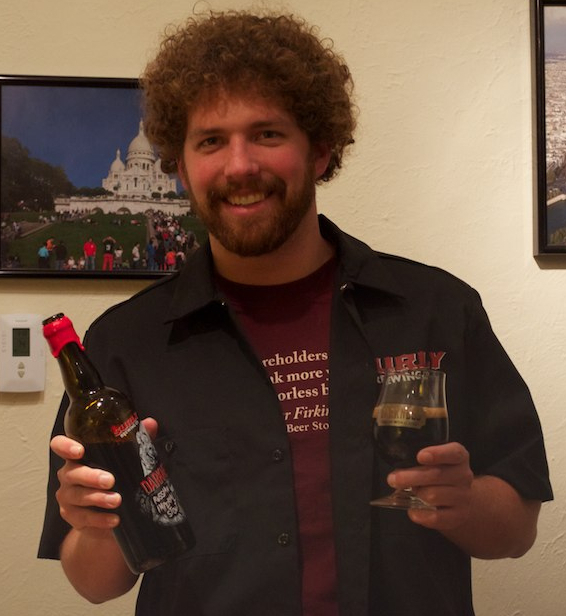 Posted in Reviews and tagged beer review, craft beer, four firkins, surly darkness. Bookmark the permalink.